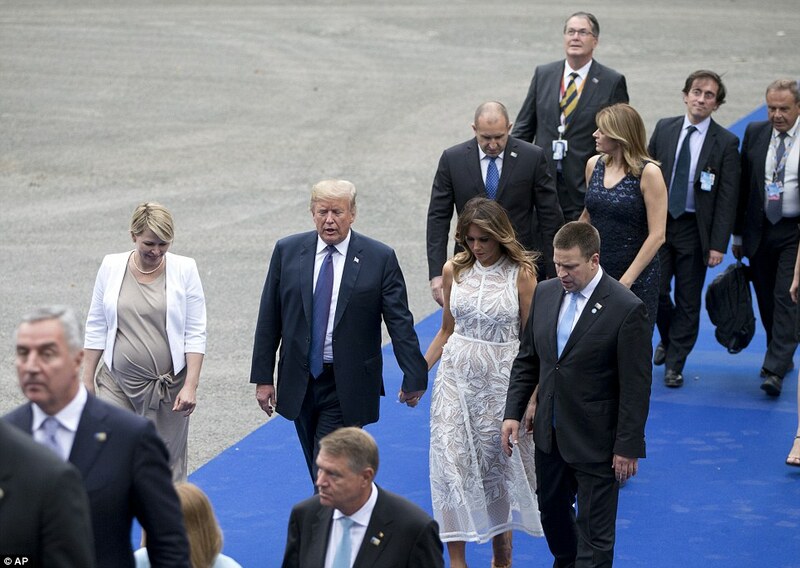 After a day filled with tension and fissures in the powerful NATO military alliance, President Donald Trump and First Lady Melania Trump gabbed with their counterparts at a cocktail party with a jazz band. The pair arrived at a cocktail party with fellow world leaders and spouses at Cinquantenaire, a park designed in the 19th century. 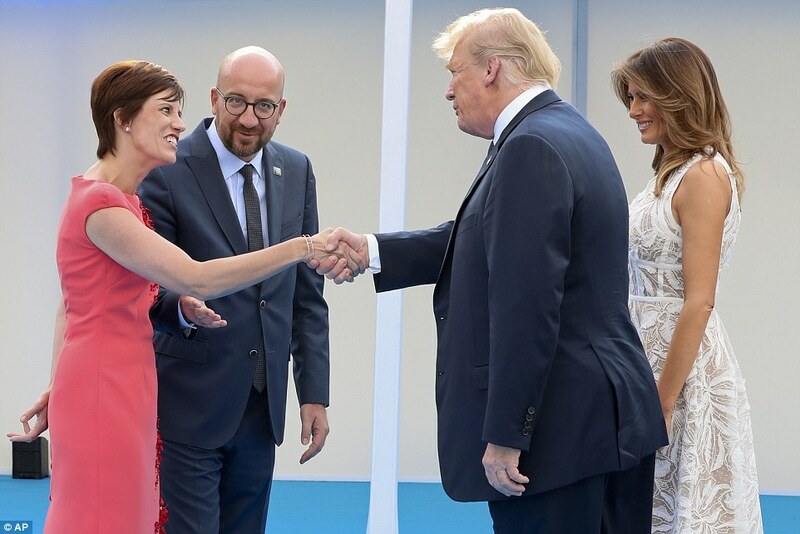 The first lady wore a $7,450 Elie Saab white patterned dress, changing out of a navy blue dress by Belgian designer Raf Simmons for Calvin Klein. Trump could be seen gesticulating as he spoke with NATO Secretary General Jens Stoltenberg, whom he complimented earlier in the day for being sympatico with his pitch for greater defense contributions. He also chatted with German Chancellor Angela Merkel, following their bilateral meeting. That followed the harangue he delivered against Germany at a breakfast meeting at the start of the summit when she wasn't present. The event was held at the Art and History Museum, and people were able to mingle outdoors. En route, they passed a triumphal arch. 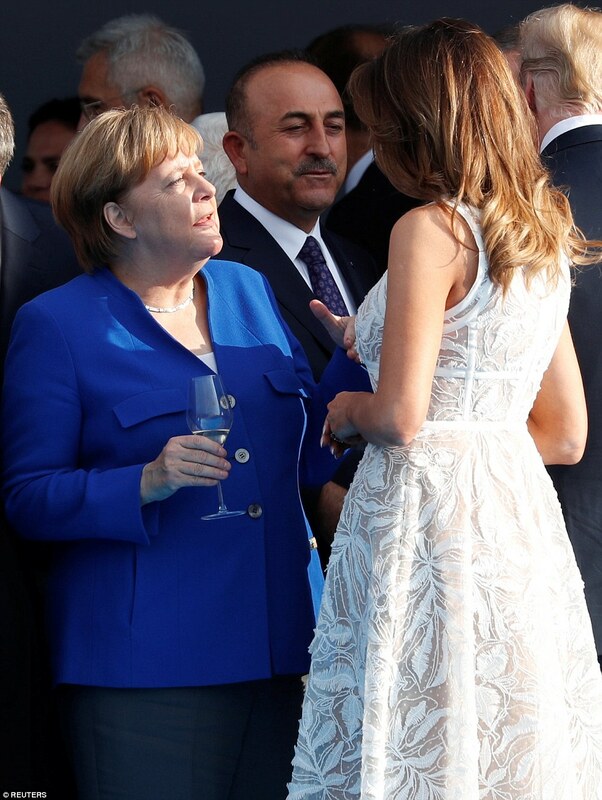 Later it fell to Melania to mingle with Merkel. The two spoke at length. The first lady, a former Slovenian model, speaks German among other languages. 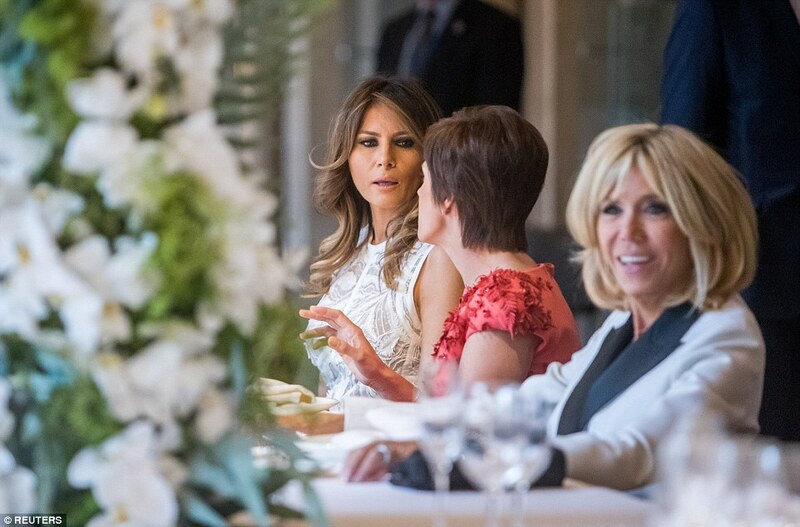 Waiters carried trays with white wine, but neither Trump nor the first lady took a drink at the start of the party. Trump doesn't drink alcohol. 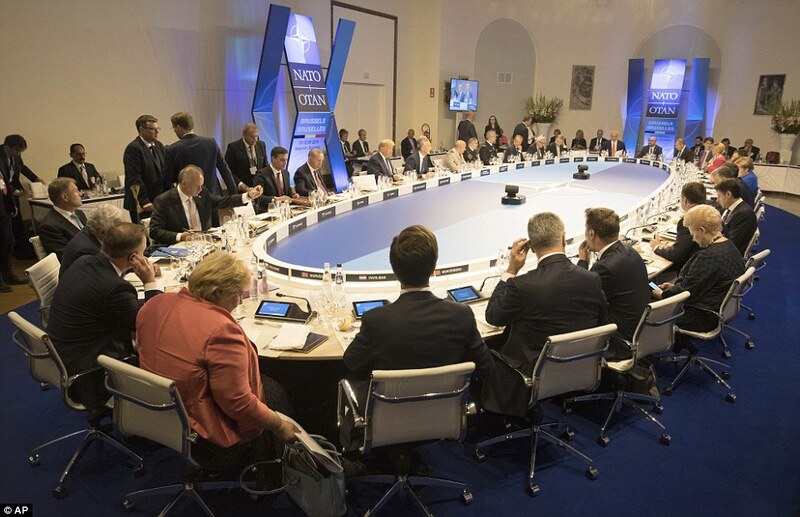 At one point during the party, Trump held court, speaking with NATO Secretary General Jens Stoltenberg, while U.S. Secretary of State Mike Pompeo stood at the edge of a circle with his hand in his pocket. 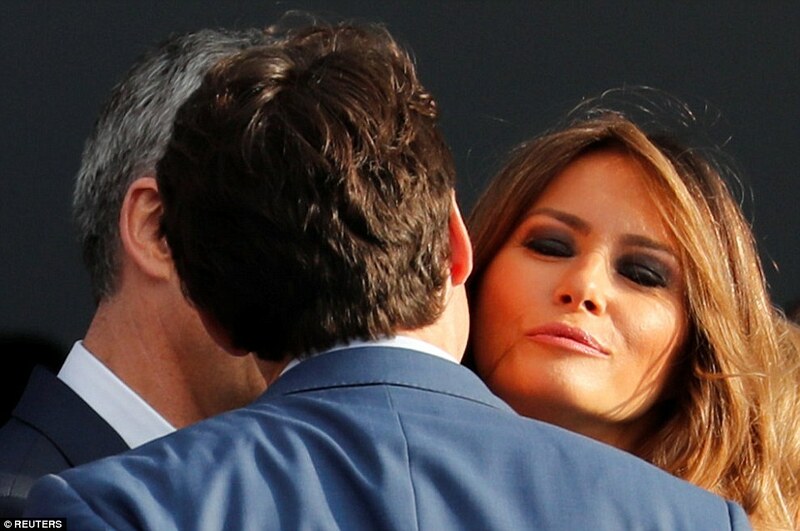 The first lady stood nearby. 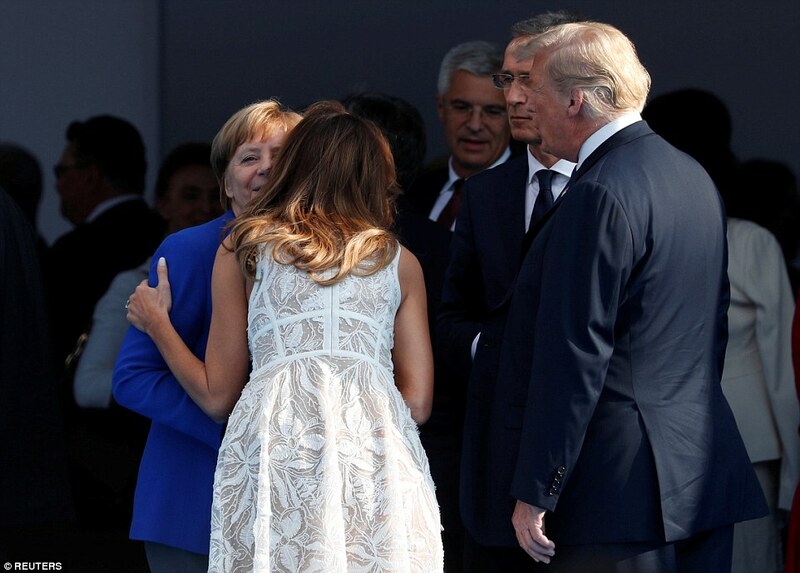 Later, Merkel joined the group, while Trump spoke and gestured to both his wife and Merkel. He appeared to listen intently as Merkel responded. Earlier, Trump lambasted U.S. allies for routinely failing to meet a 2 percent goal on defense spending. At the NATO summit, Trump demanded that they raise their contributions to 4 percent. 'President Trump, who spoke first, raised the issue not only to achieve 2 percent, today, but a new barrier - 4 percent,' Bulgarian President Rumen Radev told reporters, according to the wire service Reuters. Bloomberg omitted the part where Radev said that Trump spoke first and added a claim from the Bulgarian leader that the U.S. president left the meeting immediately after his own remarks. That exchange followed a morning appearance where Trump went after Germany for spending just a ‘little’ over 1 per cent on defense. He also called Germany a ‘captive’ of Russia and slammed a German-Russian pipeline project. 'We’re having a great meeting. We’re discussing military expenditure, we’re talking about trade. We have a very, very good relationship with the chancellor. We have a tremendous relationship with Germany,' Trump said.